Posting in a hurry this morning as I head out from the Upper West Side to yet another meeting and another tasting. 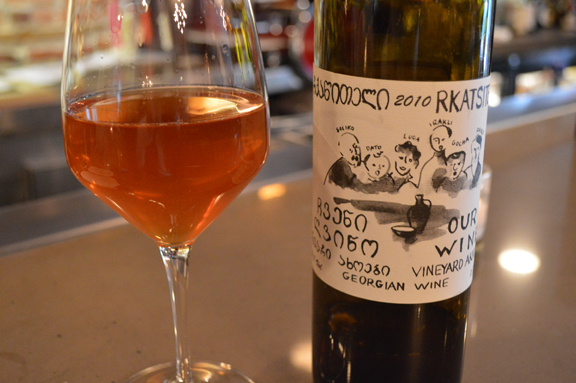 But wanted to share this glass of Our Wine 2010 Rkatsiteli (Georgia) that I had as an aperitif yesterday early evening at one of my favorite wine bars in the city, Anfora (conceived by one of the coolest dudes in our business, Joe Campanale). There’s probably no better place to drink amphora-vinified wines than Joe’s place. Although intense (and maybe not for everyone), the wine was delicious and its oxidative note made it reminiscent of a Sherry, a perfect aperitif. It’s right up the street from the place where I stay (the apartment of the drummer in my band, Nous Non Plus). 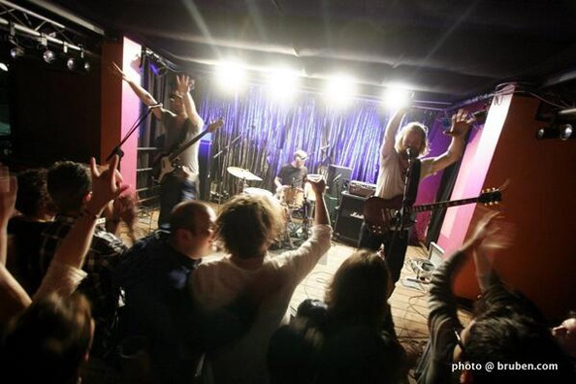 The following post is culled, verbatim, from an email sent to me by my friend Jennings Carney, bass player and one of the three Carney brothers in the über cool rock band Pontiak. He and I try to connect whenever our travels align and we’re always trading emails and notes on wines we like. He and his brothers are touring Europe right now (that’s them in the image above, at the their recent show in Turin; they’re really big in Italy, btw). 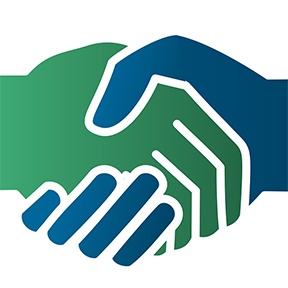 I rarely publish guest posts here on the blog but I just had to share Jennings’s insights and exhilaration. Yeah, totally dude. We just got done with a six show run through Czech Republic, Slovakia and Austria. Traveled through Burgundland and the land of Blau Frankisch, Riesling and Gruner among countless other crazy native red and white varietals that have such weird names and spellings in czech that I cannot even right them here. Nor pronounce them for that matter. … To start though in Italy, after we left Conegliano we headed to Brescia where a very good friend of mine who is a sommelier (and who put on our first Italian show) came with three bottles: two white and one red. The whites were a sparkling white, wild fermented Spergola w/Moscato Giallo from Emilia-Romagna called L’Artiglio. Insane. It was the color of coors light! Revelatory, blue cheese and forest floor notes with good acidity and boy was it funky. So cool. The other white was a biodynamic Chardonnay from Jura in France with 0 sulfites added. Made by En Chalasse it was the best Chardonnay I have ever tasted. Ever. So good. So good. As for the red – I am drinking that tonight in Liepzig. It’s a very small run Amarone. And I’ll tell you all about it after the last drop. As for the subject of the email – we went wine tasting in Southern Moravia after our show in Breclav (pronounced Bra-jitszlav) with a Pontiak fan who married into a winery called Hrdina & Dcera which roughly translates to Hero and Daughter (hero is the last name). 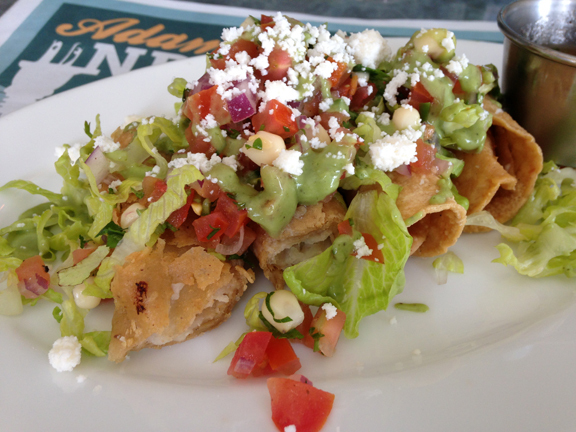 Above: Fried tacos stuffed with potato purée paired beautifully with the Tempier Bandol Rosé yesterday at Jaynes. What a thrill for me to get to play the country jams with some of my best friends and country guitar great Dave Gleason yesterday at Jaynes Gastropub in San Diego. With a weekend sandwiched between trips to LA and NYC, it made the most sense to stay over in Southern California and so Jaynes co-owner Jon scheduled an afternoon set for our Americana/country project, The Grapes (named after the legendary pub in Liverpool where the Beatles used to drink). Above: that’s Dave next to me stage right. 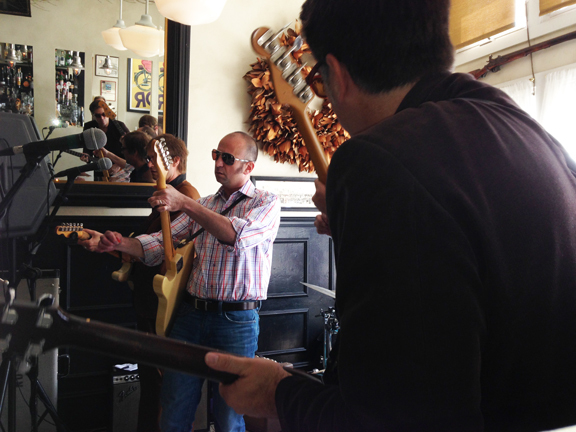 High school best friend John Yelenosky played his Les Paul Jr. and Jon Erickson played his Fender Jazz Bass. Our set was part of the 2014 Adams Avenue Unplugged Festival, featuring live music along this bustling boulevard in San Diego’s university district. 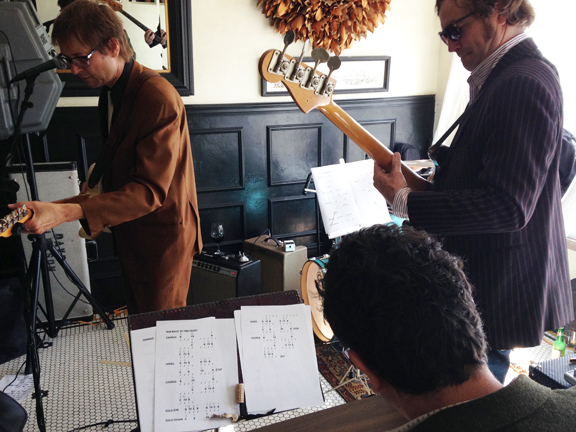 Above: I can’t reveal his name for contractual reasons but San Diego music insiders will recognize the celeb who sat in on keys with Dave’s band (foreground). Music used to be such a big part of my life and it’s such a joy for me to get the chance to rock out with people I love. Dave’s set brought the house down. He’s such an incredible, expressive country player and the breadth of his tone is amazing. He has a b-bender on his Tele and the only effect he uses is the reverb in his Fender Deluxe amp. He’s the real deal: just a great guitar plugged directly into a great amp (he doesn’t even use a tuner). 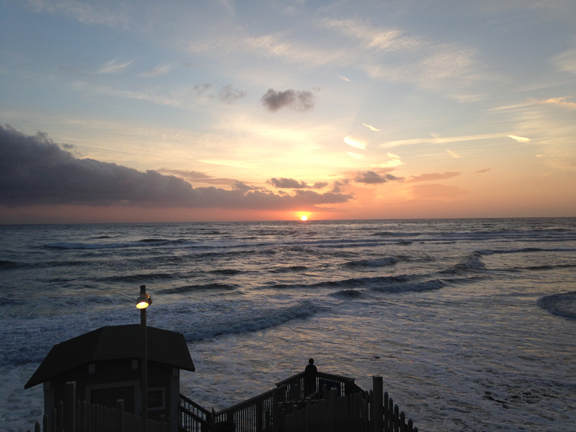 Above: they say it never rains in Southern California. “G-d is dead,” wrote Nietzsche (The Gay Science 1882). “The author is dead,” wrote Barthes (“The Death of the Author” 1967). “G-d is dead, Marx is dead, and I don’t feel too good either,” wrote the students on the walls of the 1968 revolution in Europe (quoted by Ionesco in 1979). In the demotic age of wine blogging, is the wine writer dead? Calling himself not an “impartial arbiter” but rather “a guide,” he politely argues that personal preference is fundamental in wine writing. The back story is that for many years, there’s been an ongoing behind-the-scenes feud between the editors of points-based publications and “narrative” wine writers, where the former hold that their evaluations are superior because they are the fruit of an empirical, impersonal system for critiquing wine. I would take Eric’s argument a step further. Echoing the Gertrude Stein of The Autobiography of Alice B. Toklas, I contend that all writing is purely subjective — including point-based wine reviews. That is the nature of writing. And that is, above all, the nature of wine. From St. Augustine, to Stein, to Barthes, to Derrida… critical theorists have considered the issues of subjectivity in discourse and perception for thousands of years. Who are we, now, to lay arrogant claim to a new and purely objective means of observation? 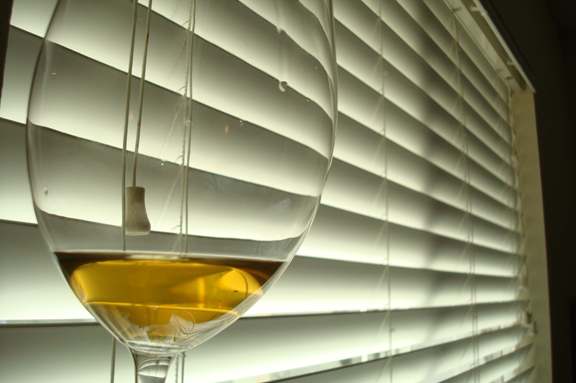 Why not embrace our humanity and our human shortcomings in wine writing? After all, we see through a glass darkly. I wrote about Eric’s piece yesterday for the Boulder Wine Merchant. My friend Katie Parla, a Rome-based food, wine, and travel writer, wrote this superb article for Punch on the Antinori-Boncompagni feud over the legacy of the Fiorano wines. In it, you’ll find an excerpt from my translation of an interview that Prince Boncompagni gave to Luigi Veronelli before he died. It’s a great piece. Everyone in the trade has been talking about Levi’s insights into the evolution of wine connoisseurship in this country. Ever since the historic Valtellina winery ArPePe began making its comeback a few years ago in Manhattan, its wines have become a sine qua non for hipster Italophile wine directors across the country. I’m happy to report that Austin has become one of the epicenters of this nouvelle vague. 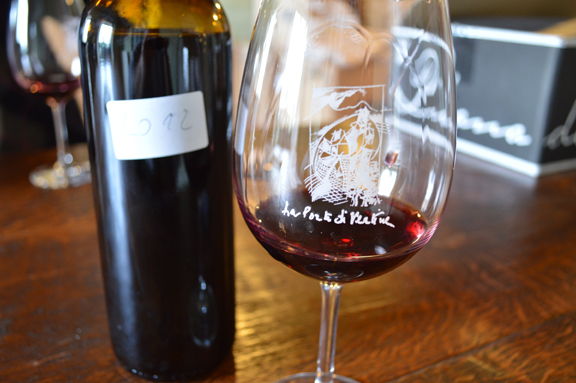 I had a chance to taste through the wines during a quickly planned trip to the River City yesterday. The 2006 Sassella Stella Retica (above) was the highlight in the flight that was poured for me at Vino Vino, my client and the best little wine bar in the Texas capital. It was interesting to talk to the folks at Serendipity, who brings the wine into the state, and the supplier rep, who told me that all the wines are made in chestnut casks. There’s one cement vat in the winery, he said, and it’s one of the biggest in Italy. 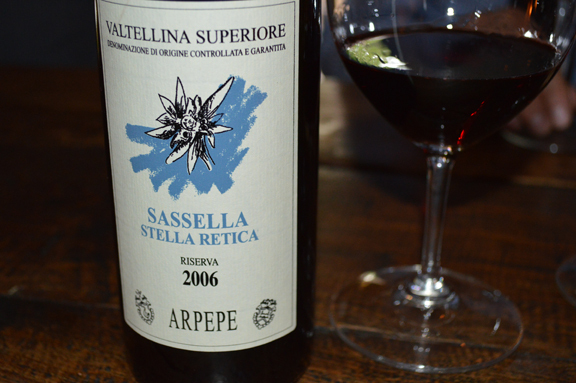 But it was decommissioned many years ago after ArPePe ceased to be the only cooperative winery in the appellation. Today, it’s used as a reception space, he said. Later in the evening, I made it down to my favorite pizzeria in Texas, Bufalina, where my buddy Steven Dilley serves the entry-tier ArPePe by the glass. 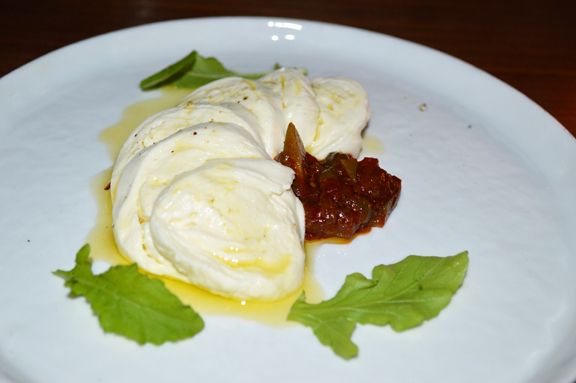 That’s his housemade cow’s milk mozzarella (above) that he uses exclusively to top his pizza. It’s never refrigerated, he says. It was delicious as was the Margherita that I shared with my good friend Billy Mann who happened to be in town on business. I awoke very early this morning and drove home in time to spend some time with the Parzen girls: I head out tomorrow for California and then NYC and so every moment with them is precious. But I’ll rest easy on my trip, knowing that Italian wine is alive and doing well in the Groover’s Paradise. Ever since I first tasted them a few years ago, the wines of Giacomo Mastretta at Porte di Vertine in Gaiole in Chianti have always thrilled me. They offer one of the most elegant yet real expressions of Chianti Classico today. In an appellation where historical marketing missteps (remember the 1970s?) and a widespread misguided desire to refashion the wines in the image of Americankind, Giacomo’s wines stand out in a crowded field of mostly anonymous and homogenous bottles. But when I had the chance to taste with him at the winery a few weeks ago, it wasn’t his superb 100 percent Sangiovese 2010 Riserva, with its rich earthy overtones, that has kept me up at night. No, it was his 2012, a wine from a challenging vintage in Italy, that really blew me away. The 2012 vintage was a warm one, said Giacomo. August was very hot and heavy rains at the end of the month weren’t enough to cool the vines and keep the fruit from becoming overripe. He didn’t make a riserva that year. Instead, he blended all of his Sangiovese, together with small amounts of Canaiolo and Colorino, as his Chianti Classico. I loved this wine. It was bright and fresh in the glass and the fruit, while ripe, wasn’t overly concentrated or sweet. And the wine’s acidity and restrained alcohol sang in harmony with its flavors. But the thing that really impressed me was how it reminded me of my first encounters with great Sangiovese in the late 1980s, before the second wave of U.S.-bound Chianti eclipsed traditional values in the appellation. I can’t recommend it enough. Like any good winemaker faced with a challenging vintage, Giacomo made less wine from the troubled 2012 harvest than he would have normally. But, man, what a wine! From the 2008 Barbaresco by Gaja to the 2008 Barolo by Bartolo (Maria Teresa) Mascarello that I’d tasted previously, I was already inclined to have high hopes for Langa wines despite the challenges of the vintage. Abundant rains in the late spring caused a lot of problems with fruit set in Piedmont and many used the word “bizarre” to describe the climatic progression for the harvest. Asti and Monferrato faced some serious issues in terms of production decline but growers in Langa, especially those with top parcels, managed to produce some superb fruit, even though many of them made less wine that year. After the first day of the fair, when our palates were still fresh, Giovanni offered to treat us to a bottle of great Nebbiolo at the Trattoria Gasparo in the historical center of Brescia where I stayed during the fair and where Giovanni lives. The owners had really beefed up the wine list since my last visit and as Giovanni read through the labels, I stopped him at Fenocchio, one of my favorites and a wine that people in my tax bracket can afford to collect. 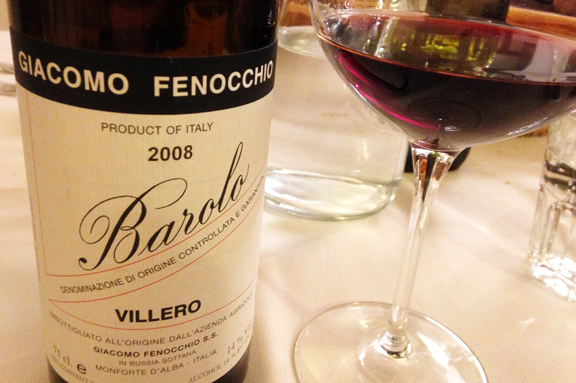 The 2008 Barolo Villero by Giacomo Fenocchio was already very generous in its expression of fruit and it had that distinctive earthiness, dark yet elegant, that I dig in his wines. Giacomo has never swayed from the old-school style of these wines and they represent a wonderful “first kiss” for wine lovers who are trying to attain a greater understanding of Langa Nebbiolo (especially his Cannubi). This is a wine that merits more attention from U.S. collectors. At the fair, Barolo producers where showing their 2010 bottlings. It was a good to excellent vintage for Piedmont, although Italy in general suffered from late, heavy rains in August. 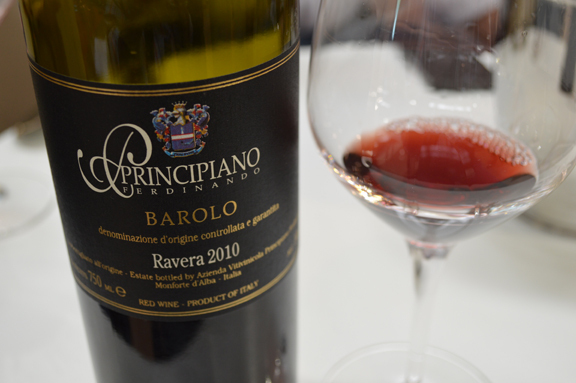 The 2010 Barolo Ravera by Ferdinando Principiano was smokin’ good. Although still very tight in its evolution, there was no “green” here: gorgeous acidity and brilliant fruit (however restrained by the wine’s youth) popped in this wine. Prinicipiano’s wines represent such great value and I can’t understand why American collectors haven’t discovered them yet. Damn, I love these wines. I can’t wait to see how they evolve. 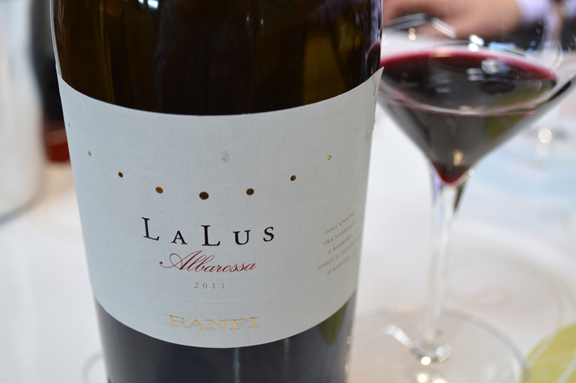 I was geeked to finally taste a bottling of Albarossa with my friend Lars Leicht of Cru Artisan, the new prestige portfolio from Banfi. Not much of this hybrid grape is planted in Piedmont. It was created in the Veneto by fascist-era ampelographer Giovanni Dalmasso, a giant of Italian viticulture, in 1938. He believed that he was crossing Nebbiolo and Barbera. But more recent study of the variety, which was first registered in Italy in 1977 and then authorized in Piedmont in 2001, has revealed that it’s actually a marriage of Barbera and Nebbiolo di Dronero, which is not Nebbiolo but rather Chatus, a rare clone of Ardèche found mostly in France but also in Alpine Piedmont (see José Vouillamoz’s entry for Albarossa in Wine Grapes; it is “not Nebbiolo at all,” he writes with his signature sternness, “but a synonym for Chatus,” a fact that was brought to light by research published in 2009). Ampelography aside, I really liked the 2011 that Lars poured for me. 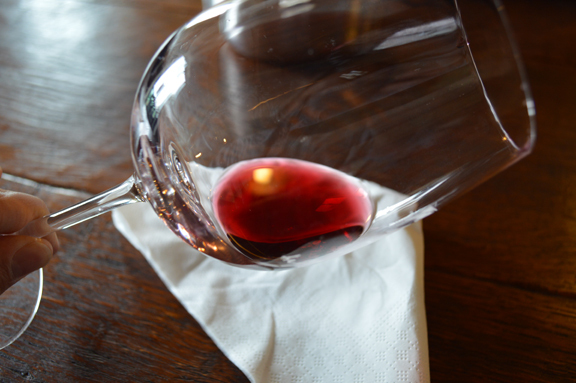 Its color was brilliant, with electric violet notes along the edges of the glass. On the nose it was fresh with confident red and berry fruit and in the mouth its alcohol was restrained and the fruit ripe but not overly so. There are just a handful of houses that grow and vinify this grape (Chiarlo is the most prominent) and beyond the nerdy appeal, I found it to be really approachable and delicious. I’d love to see what it can do at the dinner table. Facebook friends: you can see photos from Lila Jane’s baptism here. Anyone who’s ever attended the annual Italian wine trade fair, Vinitaly, in Verona, knows that after a day of tasting wines nonstop, you crave beer. I’m not sure why this is. But it’s widespread phenomenon among trade people who are tasting and spitting wine all day at the fair. This year, my fair was more about schmoozing than it was about tasting but I still managed to get in 40-50 wines every day I was there (in years past, when I would go on buying trips, I would taste up to 90 wines a day, spitting all the while, of course). By the Tuesday night of the fair, our palates were completely fried. Our teeth were stained purple and our gums were numb from tannin. So Giovanni and I decided to go out for a beer and burger in Brescia, where I was staying and where he lives. A lot of folks don’t realize that there is a beer and brewing renaissance happening in Italy right now. Artisanal beers, natural beers, “extreme” microbreweries, and a lot of downright delicious beers. 32 Via dei Birrai is probably the most well-known label in the U.S. But in Italy, there are literally hundreds and hundreds of microbreweries that find their way to market. 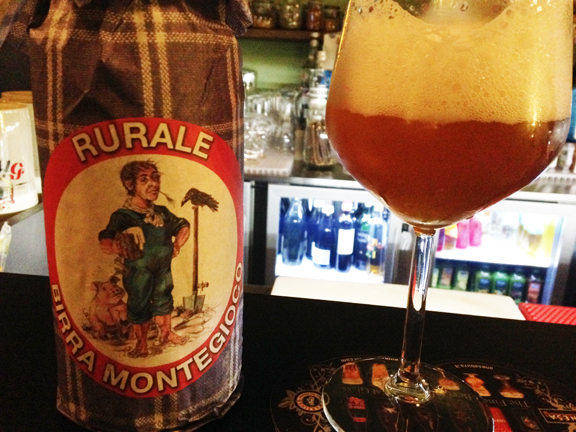 I really loved the Rurale by the Birrificio Montegioco (from the village of Montegioco in Alessandria province, Piedmont). It showed a wonderful balance of citrus and herbaceous notes with a peppery finish. It had rich texture and an overall wholesome character that really took it over the top for me. 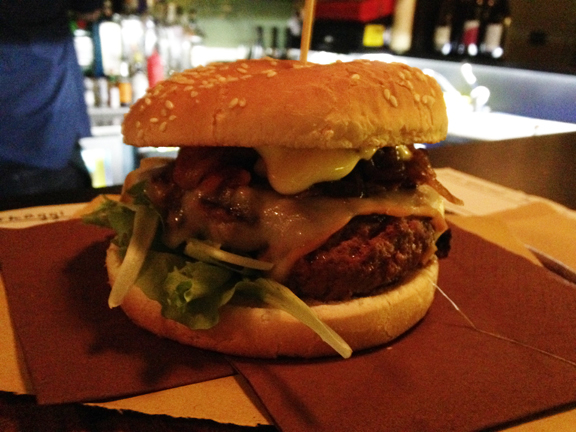 It paired beautifully with the Hamburger Rustico at the Bar Torre d’Ercole in the historical center of Brescia. I’ve written about the new wave of hamburger mania in Italy today. Milan may be its epicenter. But Brescia, where the quality of beef is marvelous and where locals love to indulge in steak and hamburger, is another flash point in the Italians’ burger mania. The quality of this beef was great and it was perfectly grilled: crunchy on the outside, with a charcoal note; rare to medium rare inside with just the right amount of fat to keep it juicy and tasty. The rustico at the Bar Torre is stopped with melted cow’s milk cheese (I’m not sure which Lombard cheese it was), arugula, and onions that had been caramelized with juniper berries. Bacon is optional and the server asked us if we wanted “bacon,” using the English term even though we were speaking in Italian. The Italian beer revolution actually began more than twenty years ago in the Veneto (I remember well because I was touring with my cover band there then). 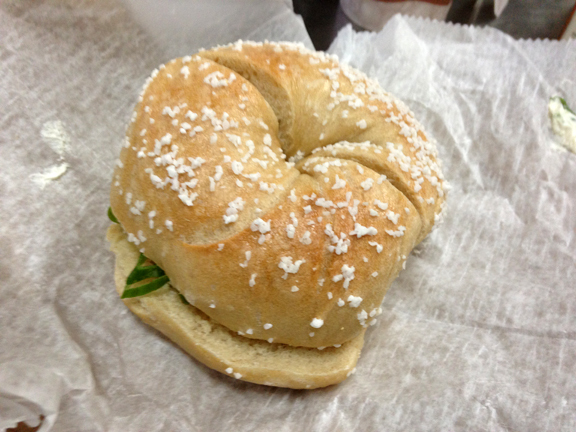 But even five years ago, it would have been difficult to find a burger of this quality in Italy. All in all, a great way to end another long day at the fair with one more day to go. I’ll start posting on the wines I tasted tomorrow, I promise! 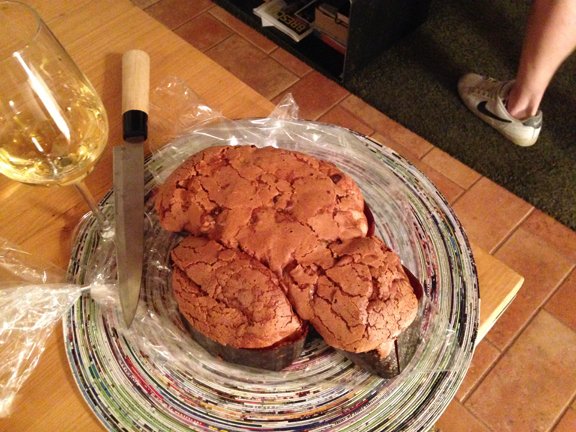 Thanks for reading… Buona Pasquetta, as the Italians say! Happy day after Easter! Above: a Colomba di Pasqua, the “Easter Dove,” a traditional Italian Easter cake by Iginio Massari, one of Italy’s favorite pastry chefs. My friend Laura Castelletti, the vice-mayor of Brescia, Italy, graciously shared it with Giovanni and me last week while I was visiting their city. It’s going to be a very special Easter for the Parzen family this year. This Easter Sunday, Lila Jane will be baptized by her grandfather, “pawpaw,” Rev. B, at the Wesley United Methodist Church, where he presides as Pastor, in Orange, Texas, where Tracie P grew up. Lila Jane will be nine months old on Tuesday. Above: Rev. 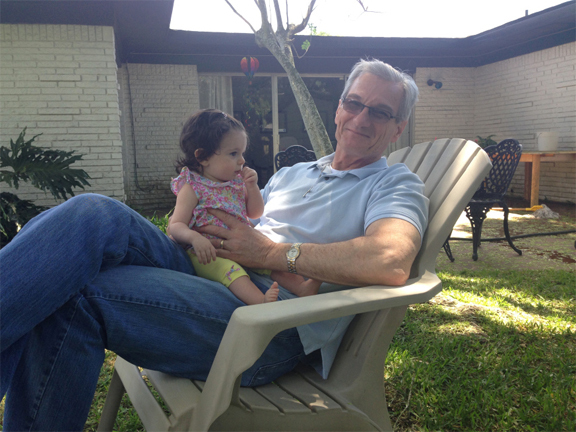 B holding Lila Jane in our garden at the new house in Houston. I wish you all could have seen the grin on Rev. B’s face when we decided that Lila Jane would be baptized this Easter Sunday. “We haven’t had an Easter baptism in a long time,” he said with his contagious smile. Just as the vine begins again to bud and flower each year, the yearly cycle of life reminds us to take stock in what has come before and what lies ahead. Nature reflects our rhythms because, after all, no matter how removed we are from her, we are inexorably linked to her syncopation. All of the springtime observances derive, ultimately, from our connection to her.